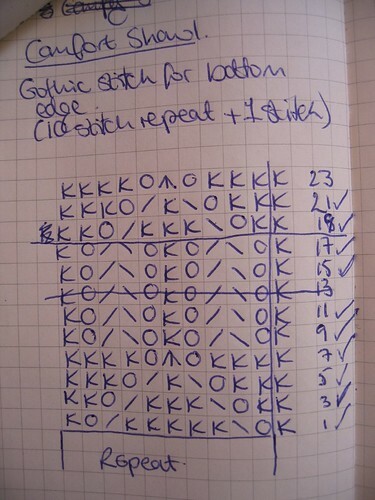 Note: There is an error in the current version of the pattern on Row 43 – it says you should decrease after the first YO at the beginning and the end of the RS row, but if you do that the front pieces won’t be triangular, so ignore those decreases, but do all the other ones. Conclusion: I like it. It’s incredibly soft, and I’ve loved the yarn (but not known what to do with it), for a long time. I think it’s going to prove really useful, both for wearing to posh do’s (like our friends wedding next month) or for keeping warm in front of the tv, or computer. It knitted up really quickly (though it would have been quicker if I’d trusted my gut about the pattern error), and wasn’t particularly boring, given that alot of it is plain stocking stitch. It’s probably taken about 3 weeks in total, but I also knit a pair of socks at the same time. Point being that it would probably work as a decent christmas/birthday present, without being too much of a time commitment. 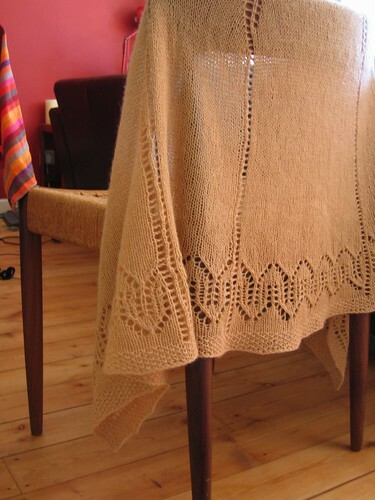 I’m definately interesting in learning more about Faroese Isles shawls, and their shoulder shaping, so I’m looking forward to reading Stahman’s Shawls and Scarves, which my sister is bringing back from North Carolina for me in a couple of weeks. 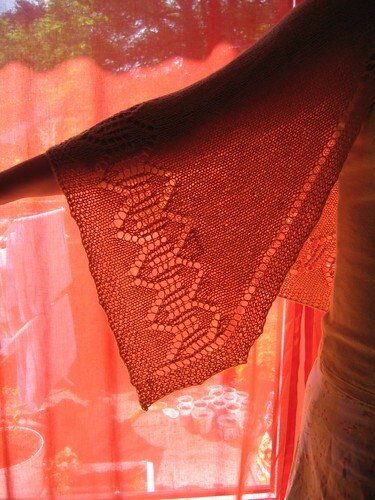 ← I’m at that bit where all I want to do is knit… because it is very *nearly* done.